When a children’s author wishes to write a piece of historical fiction, there are a number of ways to do so. They can write about a specific historical moment. The fall of Pompeii, for example, or perhaps a battle during the Civil War. They can also just pick a period in time rather than any one single moment. The most difficult historical fiction, however, is when an author decides to incorporate a real person into their fictional narrative. This technique is a staple of poorly written children’s books. You know what I mean. The old idea that falls along the lines of Martin Luther King Jr. meets a kid from the future and teaches him a valuable lesson, yadda yadda yadda. Ugh. 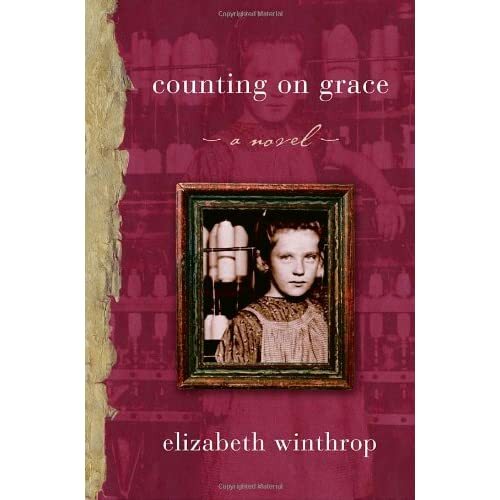 It takes a careful hand and a steady talent to do what Elizabeth Winthrop has accomplished with, “Counting On Grace”. Winthrop knows that if you were going to write a book where, for example, a small girl meets someone like Lewis Hine, you’re going to have to give your hero (not the historical figure) enough of a backstory and life to make her just as real as Hine himself. The joy of “Counting On Grace” is that even though this is a story about a horrific time concerning horrific events, it’s not depressing or much in the way of a downer. It’s a beautiful, emotional, remarkable little book. Mangled hands and all. Grace can’t stand still. Every day her family goes to work in a Vermont cotton mill while she goes to school with the other mill children. She’s a good student, of course, but she can’t even read without her feet dancing about. That changes fairly soon, however, and much to her delight. She and her friend Arthur are going to go work on their mothers’ machines in the mill, she willingly, he unwilling. But finally making some money for her family isn’t as much fun as Grace had anticipated. She’s incredibly tired and Arthur seems to have a dangerous plan in mind for getting out of working. It isn’t until the two kids help their former teacher Miss Lesley contact the authorities about the working conditions of the mill that something begins to change. Something in the form of a photographer by the name of Lewis Hine. Now Grace needs to decide what to do with the rest of her life. Spend her days working in the mill or seek something more? The inspiration for this tale, author Elizabeth Winthrop says, came in the form of a picture of a young girl named Addie. The photograph, taken by Lewis Hine, was on display in the Bennington Museum in Bennington, Vermont. The photograph is shown at the back of the book, and Winthrop tells the story of the real girl shown there. Her tale is just as interesting as that of Grace’s and “The Story Behind the Photograph” worthy reading in and of itself. Add in Winthrop’s meticulous Bibliography and you’ve got yourself some well-researched top-notch writing. Part of the wonder of this book is that Grace’s parents are neither heroes nor villains. There’s a great deal of respect given to their difficult situation. They love their children, of course they do! But these are poor people who need as much money as they can get, given their circumstances. Sure, their kids could get seriously hurt tending to the machines in the mill, but there’s always the thought that the attentive ones will survive the “lazy” or inattentive ones. At one point the schoolteacher Miss Lesley complains that she’s tired of wanting more for the mill children than their own parents want. This lack of ambition for a better life could easily have turned the story into a children = good, parents = bad tale. But life itself is not that simple. Nor, for that matter, is this book. Grace’s mother is a rough woman with a great deal of violence to her, but you understand why she does the things she does. Still, it’s hard not to agree with Grace when she happens to remark, “Suddenly, I don’t like the family God gave me”. I learned a great deal from "Counting On Grace" about why these children worked in the mills as often as they did. At first I couldn’t understand why Arthur’s mother insisted that he help her in the mill when it was clear that the two of them preferred him in school. It becomes far more understandable when you see that the mill owners owned their employees’ homes. A child that didn’t work in the mill could place his or her parents’ jobs in danger. Lewis Hine probably said it best when Winthrop quotes him saying, “I have always been more interested in persons than in people”. I know I said that the book wasn’t depressing, but not all endings in this book are happy ones. They're there to give the novel a feeling of authenticity. Winthrop doesn’t employ any miraculous occurrences or deus ex machina. Still, there is happiness here. And as Winthrop herself says of historical fiction, “I’m not saying it happened, I’m saying it could have happened”. A remarkable novel. 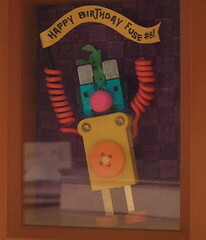 Also check out the author's website, if you get a chance. You summed this book up perfectly. I loved it and I'm not much of one for historical fiction (even though I was a history major). I found it more believable than Lyddie by Katherine Paterson, a book I enjoyed immensely. I hope we all see this book on the Newbery list this year. Stay tuned. This is going to be the first book of the year for a literature circle group in my 5th grade classroom. They've read CASTLE IN THE ATTIC and BATTLE FOR THE CASTLE and were so hoping Winthrop would write another book. I'll let you know how COUNTING ON GRACE flies in the real world. Good. Keep me informed. Lord knows I have a hard time figuring out what the kiddies actually do and do not like sometimes. This book really impressed me. I liked it that Grace was such a klutz on the looms, and that her mother was such a mixed quantity. It took a hard woman to get her family through hard times, and as an adult reader I could understand why she felt she had to make the choices she did. (I also know kid readers may not, which is what will make this a great read-again book for adults in years to come.) Having read about the struggles in the Massachusetts mills, it fascinated me to read of a place where the workers saw Massachusetts as a paradise. Interestingly, since I read this book, I've seen pictures of "Grace" pop up in interesting, non-Winthrop-related places, and I always get that frisson of friendship/greeting: "It's Grace! Hi, Grace!" That's how well I felt I knew this sepia-toned girl after the book.